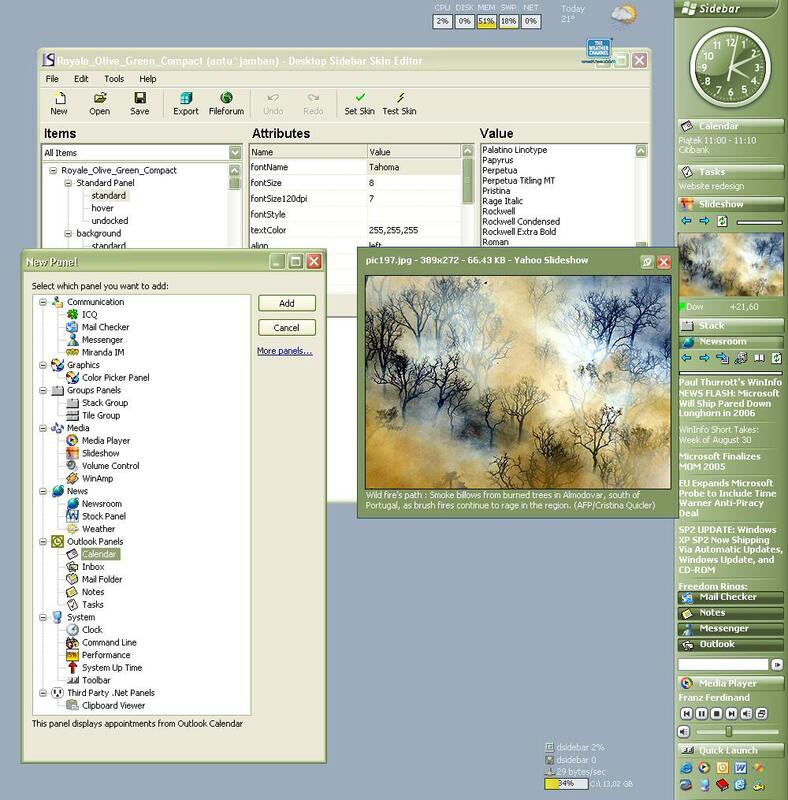 Desktop Sidebar is docked to the edge of the screen and displays not only your appointments, tasks and e-mails but also shows other useful information such as news downloaded from the Internet. It is integrated with Microsoft Outlook so you don't have to transfer your data to a new application. When are you using it you don't have to switch to Microsoft Outlook in order to check your schedule. Your schedule is always displayed on the screen and one look at Sidebar is enough. It displays information in separate panels. The user can freely arrange panels by adding, removing or moving and grouping together. nice program, though not as fast as I hope, but overall it's good. klipfolio is another good choice too. ++ all the plugins i chose worked without problems i can say. +- some plugins especially the perf monitors have good details but also some have less options..
-- uses net framework & xml which equals to slowness on my p3-733. sometimes up to 40% with about 10 plugins enabled. tlb does the same with much low cpu. this is because of using the xml bloat i suppose..
-- skins not visually esthetical much. -- panels not visually esthetical to each other.. all those panels added to the bar visually a mess what i see is. result: truelaunchbar wins definitely if u have money.. ds wins if u can resist those negativities.. samurize can be another free alternative. my choice is tlb. This is a great program. Easy to install and modify to my needs. I cannot work without it anymore. This is not a tough crowd - just one that expects a standard of quality to be upheld, especially when it has int he past. Why release code without taking the time to include optimizations that were considered de riguer in all previous versions, especially when there is no urgency to push new releases out the door? I have long used, championed and recommended this utility and can now do so again. All that remains is for the dev to issue a long overdue final release. Tough crowd here...it is freeware. roj: Then restrict the size of your page file. Problem solved. The installer breaks if you have an existing version of Desktop Sidebar installed. They really should test these common scenarios before release. The last two builds of this app have the not-so-small issue of immediately triggering the OS (XP / SP2) to increase my virtual memory paging size. I note that this is due to changes and memory optimizations which must be made more current. Fix this please. THREE stars until it's fixed. Also, we gonna get a final before the end of the decade? Kludging my swap file is not a panacea for shoddy programming. I do love this utility and find it indispensible. However, I'm tired fo the incessant betas. It's time for a new final release. **** or get off the pot. FOUR stars for a superlative tool that's starting to cook too long. In my view, it's the best of the sidebars currently. Although you do tend to find the others all have something that is good and you wish were on the one you want to use. However, Desktop Sidebar has the most things I want. Unfortunatly, the 113 update hasnt fixed the stocks issue. It shows the correct share/index price/value but the up/down flag is wrong. You think the market is up 100 when its actually down!!! A must have for me, and it just keeps getting better. Also can be used as a security tool to monitor internet traffic up and down, CPU and memory usage. Very slick and configuration abilities are awesome. About the "katipo's" comment. The sidebar in Vista is no longer on by default but rather an optional startup item.